If you’ve traveled through northern Lancaster County at any point in the last 168 years, you might have noticed a structure of religious importance lying just feet from the current Route 322. 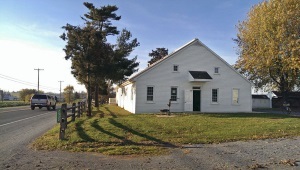 The Pike Mennonite Church is shared by two groups of Mennonites (Stauffer and Weaver), who use it on alternate Sundays. Unlike most Amish, Old Order and Conservative Mennonites worship in church structures. 168 years is how long the building has been in service as a church. Constructed in 1840, it was originally a school. So why are the Mennonites moving after such a long time? For a few reasons. Acoustics are apparently poor inside, due to 9-foot ceilings, and people can’t hear as well as they should. Compounding that problem, it’s quite close to the road, and the noise of passing cars and motorcycles. Finally, the structure itself is said to be in poor condition. The new church will be slightly larger and will have higher ceilings to provide for better acoustics, but it will mirror the original structure in appearance and will be devoid of electricity and running water. In the photo below taken from Google Street View, you can see two long horse sheds. These will likely stay put for now but may be moved in future. And what will become of the old building? This surprised me somewhat, but according to Ralph Brubacker, builder of the new church, it will probably be torn down. Hat tip to Ed C.
I understand the need of a new church. But why tear down the old one. There are so many things it could be use for, ie: meeting house, farmers market, quilting bees, singings, a place to sell crafts and quilts ect. I could still be useful. I think they could use it as a storage facility, as an information centre so not to let unwanted visitors to trample the new church so much. I love how this building was built in the 1840s and still looks surprisingly like contemporary Amish/Mennonite buildings of today as pictured throughout the pictorials of Amish America. Considering that it is a well and long lived in meeting house it outwardly looks like its held up really well. An arm of my family lead the building of an Ontario church, which still stands but is a historic site completed in the 1830s, and I know that that building was almost lost, certainly the property it was in was reverted back to farm field after the congregation passed away, not that these LC Mennonites have that problem, but our kinfolk’s community most certainly did. I think most historic buildings should be preserved, or at least re-porpoused. It must be rather damaged or otherwise quite costly to repair/maintain in some form. With the local appreciation for historic buildings one would think this would be one people would be motivated to preserve. In the community that my ancestors lived they built a couple of smaller worship buildings before they build the one that recognizably remains, I read that one of these short lived buildings was torn down and the materials incorporated into someone’s home in the area and last I heard still standing, but I’m guessing that construction laws in pre-Confederation Ontario where different than they are today. I agree with SHOM about repurposing the building. It has too much history to be torn down, and I hope someone restores what they can of it. Its problems sound a lot like a one-room schoolhouse I visited just a few years ago in my county—floors were spongy and we were told we were touring it at our own risk, due to its poor condition. (I believe it was built in the 1880’s if not earlier.) It has since been repaired & is still on tours (without the disclaimer, now). There’s a house in my own neighborhood that was built in 1865 that is still standing and being used for offices! It amazes me whenever I pass it by, thinking it dates back to the end of the Civil War…I get the shivers! If nothing else, I’d be willing to pay a few bucks for a “chunk” of the building—and the Mennonites could use the $$ for their missions. Deal? I have a special fondness for Old Order Mennoites. I find the groups that I visit are somewhat more open to interactions than some of the Amish in my area. I often interact with the groups from Synder County , Pa. While they adhere to very traditional values, they are friendly and very open to the English. These folks do not live in the past and their history is not quite as important as some old Order Amish. I’ve only seen only two history books about Old Order Mennonites as compared to several Old Order Amish history accounts. We have to trust these people to do what’s right for them. They know what’s right. On another subject…..this week in Lancaster County there was a tragic traffic accident involving an Amish buggy being hit by a mini van. The story can be viewed if you go to the Lancaster County Intelliencer news paper report on the incident. It was not a minor accident and details are still sketchy. Yet another example of old world vs. reality. Eric, perhaps you could visit the newspaper’s article and gather enough info for a report on what happens intoday’s world. Warning…..it’s very sad with disturbing photos. I was reading about the accident I believe you’re referring to yesterday Jerry, though didn’t see any photos, maybe I missed them. The article said that the buggy actually ran the stop sign in that case, and 7 were injured. It seems there is a new accident reported somewhere every other day. I’ve just seen a report on a hit and run on an Amish buggy in Michigan. Jerry, I like your comments esp. regarding not living in the past. Historic preservation is nice, but I find it more satisfying to see new innovative structures be built that may become the landmark buildings of tomorrow. Too often, the costs of historic preservation are borne by the property owner, while the benefit of seeing a cute historic neighborhood are mostly enjoyed by tourists. Neighborhoods change over time; I’m glad these Mennonites recognize that. They are also demonstrating that “the church” is not a building — all buildings will eventually rot and collapse. Rather, the church is in the hearts of the community of believers. We live in a house that is turning 100 years old in a little over 3 years from now. We bought it 30 years ago this coming April. So you can see that we have owned it about 1/3 of its existence. The place was not “nearly”, but ACTUALLY collapsing in some places. We purchased it just months before the real estate market cratered in our state. The idea was to do a quick fix up and flip it, but the problem was that in about 6 months after the purchase it was worth less than 1/2 of what we paid for it. So we kept it and we are glad we did. However, it was NOT an easy decision to invest all that money into a project that, at the time, looked like a losing proposition. Our oldest was 18 months old when we purchased it, our youngest was still 3 years away from being born. Both grew up there & we all cherish that house. Still it is “just” a house. Someday, and maybe sooner than later, it will belong to another family & we are okay with that. Here is the rub on the entire thing though; we spent literally thousands of hours of our personal time on that house and enough money that we could have gone out and had a nice custom built home constructed instead. While we could have never have had built what we have in the way of a home, the reality is that most people would not have been in the financial situation that we were to even consider doing what we did. While we were blessed to be able to do so … unless you have taken on a project like this you probably have NO IDEA how much time, work and $$$$ are involved. Even if the traffic noise, proximity to the highway issues could be corrected by moving the building, it could very well be that this church body doesn’t have, or is not willing to invest, the resources necessary to correct all that is wrong with structure. Been there, done that. Glad that we did it, but will never do it again!